VMware Player is installed on all Windows machines in the 1245, 2301, Elder, and Hering labs except the HP XW4300 models that are in 2301 and Elder and Hering south labs. (Check the Lab Hardware Guide for the specific machine names of the XW4300s.) If you see the Local Linux Machine icon as shown at left, the computer has a virtual Linux machine you can use. Double click on that icon to launch a virtual Linux machine session. Wait while the virtual machine loads. You will automatically be connected to a machine named l-lnxvm000. Option: After you enter your Username (Engineering account ID), you can select the Session Type; we suggest KDE4 or Default. 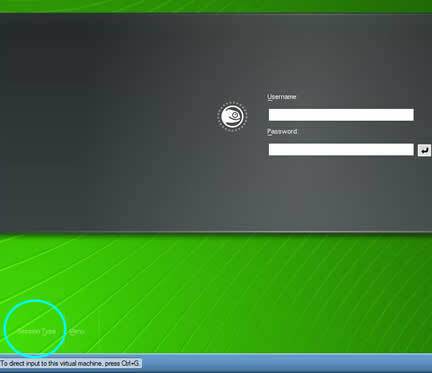 Click Session Type at the lower left corner of the Linux login screen (circled in the illustration below). If after you log in you do not like or did not get the window manager you expected, log out and start the Linux virtual machine again, and choose the Session Type before you log in. Once logged in, you have access to essentially the same Linux environment that is available on a real, physical Linux workstation in the lab. If you need to save files to a USB key, read the related USB Key page. When you want to end the virtual Linux session, it is best to log out or shutdown, and then close the virtual machine window by clicking on the X in the upper right corner of the VMware windows. Click inside the Linux window or press Ctrl + G to have the cursor in the Linux screen and respond to input. To move from the Linux window back to Windows, press Ctrl +Alt. If you want help using the virtual Linux environment, please see the consultant at the Engineering Help Desk in 1253 SC, 319-335-5055.